Rafael Nadal beat fellow Spaniard David Ferrer to win Roland Garros for a record eighth time. 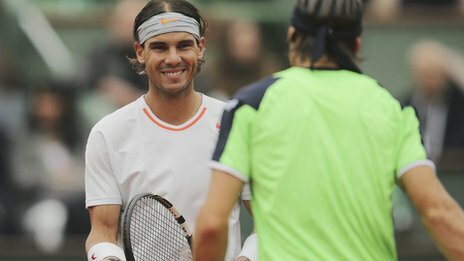 Nadal beat Ferrer 6-3, 6-2, 6-3 but the match was marred by a court intruder running on with a flare targeting Nadal. He was then hauled away by security guards and Nadal showed his gratitude by shaking the hand of one of the officials. Ferrer battled hard and well against his superior in his first major final at the age of 31 but it was a fairytale story for Nadal as he put his name among the greats of sport with his record breaking win. Protesters targeted the French Open Final, but this was not to thwart neither attempt to triumph at the French Open. Both men matched each other in the opening stages but Nadal fired a brilliant cross-court backhand winner to move ahead again at 4-3 and took the set with a third break. Ferrer was making his illustrious compatriot work for his service games and missed an early chance in the second set, before Nadal made him pay with a forehand winner for 2-0. In the end, Nadal was worthy of an eighth Roland Garros Title and David Ferrer's tournament came to an end against a deserving winner.